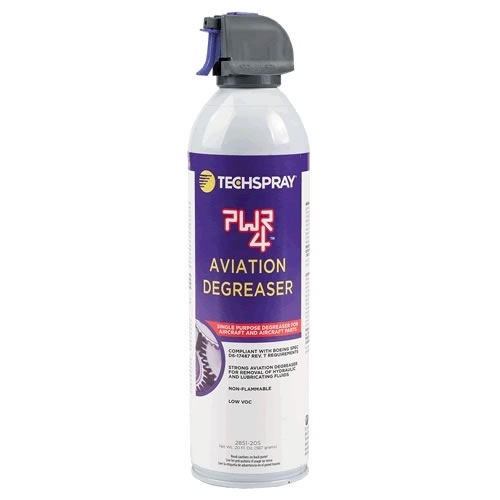 Specially engineered aviation degreaser with strong grease removal of hydraulic fluid, fuel oils, lubricating oils and greases, and other organic residues. PWR-4 Aviation Degreaser spray features a powerful, long-reaching spray to clean hard-to-reach parts from as far as 10 feet. Fast evaporating, quick penetrating, and ideal for cleaning aviation parts. VOC compliant for EPA, CARB and SCAQMD. Meets (modified) MIL-PRF29608 (AS) 2008 – with the exception of flux removal (not tested).